2606 Books and counting..........: Literary Blog Hop Time - Come And Get A Book While They're Hot! 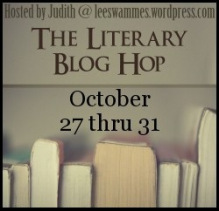 Literary Blog Hop Time - Come And Get A Book While They're Hot! Seeing as I’m giving away free books, I’m sure no one will mind that my entry to the latest Literary Giveaway Hop, run by Judith at Leeswammes' Blog, is just a couple of days late. As with my previous hop giveaways, I’m offering each of two of you a book of your choice from the list below. The rules are simple - all you have to do is to read the list, choose which book you’d like to receive if you win and leave a comment below, telling me your choice and leaving some way of getting in touch with you. The deadline for leaving comments is 6:30 a.m. on Thursday 1st November, the chosen hour being the time when mini-Falaise is likely to rouse me from my slumbers. I'm happy to deliver to anywhere Amazon does! If you haven’t already done so, I’d also recommend you visit the other participants in the hop and see if you can gather up more from this instalment of the hop. 1. The Hobbit by J.R.R. Tolkien. It’s a classic, the film is soon to come out and Tolkien was not just an Oxonian but a fellow Exonian to boot so what more excuse could I need to offer one of the great children’s novels of all time. Really, you should read it; you know it makes sense. I’ll tell you what. Seeing as how, deep down (verrrry deep down), I’m a kind and generous soul, if you’d prefer The Father Christmas Letters by the great man, you can choose that instead. After all, it’s less than two months away now! 2. The Golden Compass by Philip Pullman. Having claimed the distinction of having been at the same college of Tolkien, I’m going to double down on specious connections by pointing out that Mr Pullman is also an alumnus of Exeter College and offering you the first volume of his wonderful His Dark Materials trilogy. It’s even more appropriate for this list as it is part set in Jordan, a fictionalised Oxford college. 3. The Screwtape Letters by C.S. Lewis. Now, I bet you were thinking I’d put C.S. Lewis, Tolkien’s fellow Inkling, into this list but I bet you didn’t think it would be The Screwtape Letters, his epistolary Christian novel, in which Screwtape gives a novice devil, Wormwood, a set of advice on how to tempt human beings into sin. 4. Brideshead Revisited by Evelyn Waugh. Really straining my claims to fame, Evelyn Waugh and I were at the same prep school, albeit several decades apart. Brideshead is probably his best-known novel but, if truth be told, is neither the best nor my favourite of his works. Nevertheless, sticking with the Oxonian theme, feel free to choose it. But, if you prefer, you can go for the Sword of Honour trilogy or Scoop, both, in my humble opinion, much better novels. 5. Gaudy Night by Dorothy Sayers. A Lord Peter Wimsey detective novel set in Oxford, this fits right into my theme as well as being a favourite of mine. It’s a good one, trust me. 6. The Picture of Dorian Grey by Oscar Wilde. Apparently this was his only novel and a pretty good one at that. 7. Stamboul Train by Graham Greene. Although nominally a novel, it’s really a collection of linked short stories, telling the tales of a number of passengers on a trip on the Orient Express. It’s also one of my favourite Greene books. 8. The Wimbledon Poisoner by Nigel Williams. A hilarious novel about a solicitor from Wimbledon who decides to poison his wife, with unexpected consequences, I can thoroughly recommend this one. 9. The Secret Pilgrim by John le Carré. The structure of this novel is that of a series of reminiscences by Ned, a former senior member of the Circus, le Carré’s fictional MI6. Like Stamboul Train above, it’s more akin to a series of short stories. For those who don’t like spoilers, this reveals the identity of the mole in Tinker, Tailor, Soldier, Spy and the ending of The Russia House. 10. Watership Down by Richard Adams. Confession time: when my mum took me to see this at the cinema I cried. Real tears and everything. Anyway, it’s a true classic of children’s literature and if, like me, you have the misfortune to be in possession of a small person, you owe it to both them and yourself to introduce them to this…..and then cook them rabbit stew for tea. Now, you know what to do. Leave a comment below and go and check out these other fabulous giveaways! Lovely giveaway :) And you're correct, as long as you're giving away free books it's ok to be late, lol. I'd love to win a copy of Watership Down! Great list, and thank you for the giveaway opportunity. I'd love to win a copy of The Wimbledon Poisoner - it's the only one of your choices that I have never heard of before and I am intrigued! Many thanks for the giveaway,Falaise. I would love the chance to win anything by Waugh. The Wimbledon Poisoner sounds great! Thanks for joining the blog hop, if a little late. It doesn't matter at all! What a generous giveaway you're doing! I already have most of the books on your list but I'm reading my first Graham Greene, The End of the Affair, and am intrigued by Greene. If you're looking for a good home for Stamboul Train, I would love to have it. I like the premise--reminds me of a collection of Maeve Binchey stories I read years ago about various people who lived along a subway line in London. I'd love to read Watership Down or Dorian Grey (in my read list for a long time)! Very cool idea! I'd like to win a copy of Stamboul Train by Graham Greene - I've read many of the others, but not this one (I've only read The Power and the Glory, which I did enjoy). Thanks for the generous chance to win a book. I'll put my name in for Greene's The Stamboul Train. Thanks for sharing such a lovely giveaway. I'd love to win Gaudy Night by Dorothy Sayers. Thank you! I've seen a movie version but I want to read The Picture of Dorian Grey. If I win I would love a copy of The Picture of Dorian Grey by Oscar Wilde. Thanks! I would love a copy of The Screwtape Letters! Thanks for the giveaway! OHHH, The Wimbledon Poisoner! I really need to laugh. Thanks for the chance!! I would love to win Gaudy Night. I thoroughly enjoy short stories so I'd love to win a copy of STAMBOUL TRAIN. What a creative theme! Thanks for the giveaway. Stamboul Train would be my choice. I enjoy reading short stories and on the Orient Express would be a great setting. I would pick Gaudy Night. Sounds great. I'd love to read Brideshead Revisited. Thanks for the giveaway! Gaudy Night or The Wimbledon Poisoner. I appreciate the chance to receive a winner of a copy in my email. I'd love a chance to read Stamboul Train - thanks for the opportunity! The Father Christmas Letters sounds intriguing. Great list and a tough decision. But I'll go with Stamboul Train. Wimbledon Poisoner sounds interesting. Thanks. I'd love to win The Golden Compass, thanks! I loved Watership Down, too! !